The 163-storied Burj Khalifa in Dubai is the building with the highest number of floors in the world. The Burj Khalifa, the building with the highest number of floors in the world. 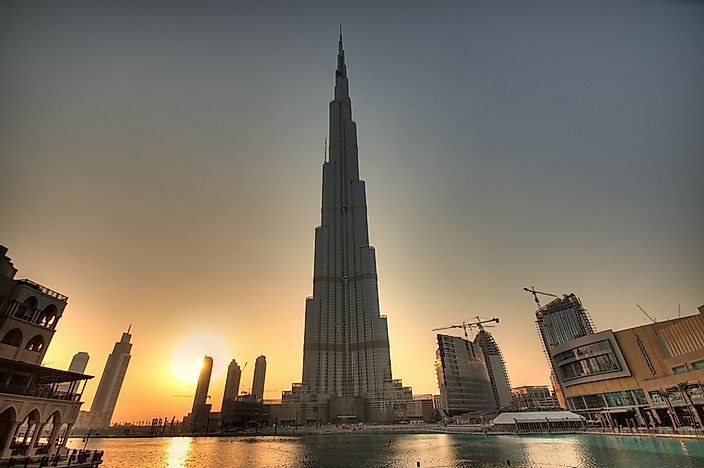 The title of the building with the highest number of floors in the world goes to the 163-storied Burj Khalifa, a renowned landmark of the city of Dubai in the United Arab Emirates, or UAE. China boasts eight of the world’s top 20 buildings by the number of floors, followed by the US with four and the UAE with three. For cities like New York, Shanghai, Dubai, Guangzhou, Hong Kong, and Chicago, skyscrapers are a characteristic feature of their landscape. Construction of the Burj Khalifa commenced on January 6, 2004, ending on December 2, 2009. At 2,717 feet high, it is the tallest building both in the UAE and in the world. The tower's 163 floors include nine maintenance floors and 154 occupied floors as well as two parking levels underground. Occupants use 57 lifts to move between floors. It was designed by the American architect Adrian Smith associated with the Skidmore, Owings & Merrill firm. The building has residential, hotel, and corporate suites and an observation deck popular with tourists due to breathtaking views of the city. The skyscraper with the highest number of floors in Asia is the Shanghai Tower in Shanghai, China with 128 floors. Its construction began on September 6, 2014, and ended on February 18, 2015. At the height of 2,073 feet, it towers over the surrounding area in Pudong District. It was designed by the Gensler firm, and its principal contractor was Shanghai Construction. The building is mixed use, and it hosts restaurants, boutiques, and hotel rooms. It is serviced by 106 lifts reputed to be the fastest in the world at 20.5 m/s. The Lotte World Tower is a 123-storied skyscraper in Seoul, South Korea. It stands at 1,819 feet to be the world’s fifth tallest skyscraper. The tower’s construction commenced on February 1, 2011 and ended in December 2016. It was designed as both a residential and commercial building by the American firm Kohn Pedersen Fox Associates. The tower gained world reputation in April 2016 after two photographers bypassed security and ascended and descended while it was still under construction. The photographers, namely Vitaly Raskalov and Vadim Makhorov, posted pictures and videos attracting worldwide attention. The Lotte world Tower has 123 floors. The Abraj Al Bait Tower is a government-owned skyscraper making up a complex consisting of seven skyscrapers in the Saudi Arabian City of Mecca. It boasts a height of 1,906 feet, composed of by 120 floors. The tower is strategically located opposite an entrance to the famous Masjid al Haram Mosque. A five-star hotel in the tower caters for the millions of pilgrims who flock to the mosque during the Hajj. Also in the tower are residential spaces and a shopping mall. More than a thousand vehicles can park in the structure’s garage parking. Human population has been rapidly increasing in cities across the world and construction of skyscrapers has emerged as a solution to the issue of shrinking land resources. The popularity of towers is fueled by the fact that they maximize on space and hold many units. Currently, several towers are under construction set to be taller than the completed ones. An example of these skyscrapers is the Jeddah Tower in Jeddah, Saudi Arabia, which is proposed to be 3,307 feet high by the time it is completed in 2020. Which Buildings Have The Highest Number Of Floors In The World?